Following on from the success of their X100 and X100S premium compacts, the new Fujifilm X100T utilises the same 16.3Mp APS-C X-Trans CMOS II sensor, which negates the need for an Optical Low Pass. Boasting a base sensitivity range between 200-6400 (extendable to 100-51200), the X100T also features Fujifilm’s high-speed EXR Processor II engine for crunching through your picture data. The fixed Fujinon 23mm lens (equivalent to 35mm in full-frame terms) boasts a ‘fast’ maximum aperture of f/2, for shooting in low light, as well as a minimum focus distance of just 10cm for close-up photography. 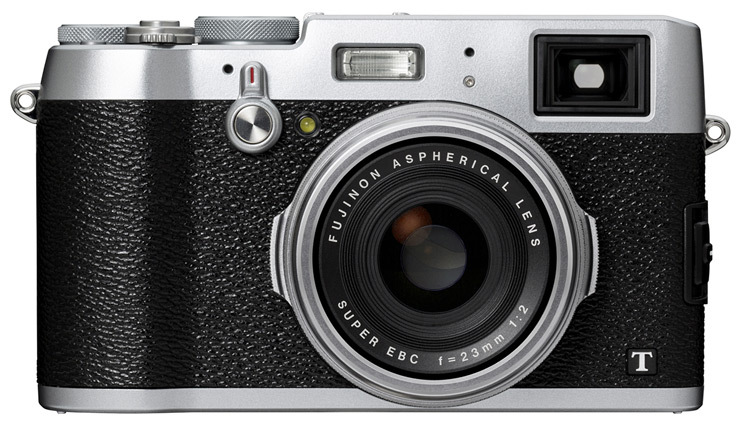 Billed as the world’s first electronic rangefinder the Fujifilm’s X100T’s Hybrid Viewfinder can simultaneously display a magnified focus area in the corner of the frame, as well as the traditional rangefinder-style view. Extra functionality over its predecessor has been added too, thanks to its 7 customisable Fn buttons, customizable Q button, and the addition of a 4-way controller on the rear of the camera. The mechanical aperture ring now offers control in 1/3-stop increments and the X100T’s Ev dial on the top-plate has been extended to offer up to +3 stops of exposure compensation. Fujifilm’s Film Simulation mode remains for all the lovers of old Fuji film effects, such as Velvia or Provia, and a new Classic Chrome effect has been added, which Fujifilm claim delivers muted tones and deep colours. The X100T’s 3.0in LCD screen offers a 1.04m-dot resolution, there’s built in wi-fi for easily sharing photos and the hybrid autofocus system can switch between phase or contrast detection modes according to the scene. For video the X100T offers full HD capture with selectable frame rates of 60/50/30/25 or 24fps and Fujifilm’s Classic Chrome film simulation modes can also be used during video capture and be previewed in the viewfinder. A range of accessories including handgrip, wide-angle and telephoto lens adapters, external stereo microphone and hotshoe-mounted flashguns are also available.